The industry-standard Small Form-Factor Pluggable (SFP) transceiver modules are hot-swappable input/output (I/O) devices that plug into 100BASE, 1000BASE and 10GBASE ports (for SFP+), which connect the module port with the fiber-optic or copper network. 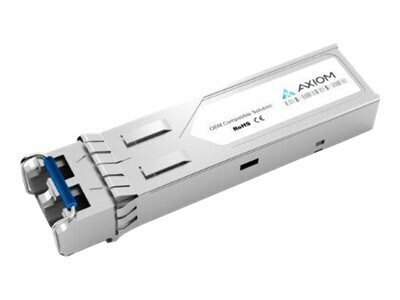 The 1000BASE-LX/LH SFP transceiver module for SMF, compatible with the IEEE 802.3z 1000BASE-LX standard, operates on standard single-mode fiber-optic link spans of up to 10 km and up to 550 m on any multimode fibers. When used over legacy multimode fiber type, the transmitter should be coupled through a mode conditioning patch cable. - Chassis-The Cisco Gigabit Ethernet Half-Height Line Card is supported in the Cisco uBR10012 Universal Broadband Router. - Performance routing engines (PREs)-The line card is supported with the Cisco uBR10012 Performance Routing Engine 2. - Line cards-The line card is supported with Cisco broadband processing engines on the Cisco uBR10012. - Carrier-The Cisco uBR10012 Gigabit Ethernet Half-Height Line Card requires a carrier (part number ESR-HH-CARRIER) for compatibility with the Cisco uBR10012. For more information about the carrier, refer to that component's data sheet.